Based on subject matter-specific research, three youth education books were developed for children, teens, and young adults. These books follow the same structure as the family guide (i.e. addressing what is ALS, caregiving, family and friends, and end of life). Yet, each book is presented to target the developmental stage of the youth. These books are available in print and digital form. Graphic novel for youth, ages 7-12. 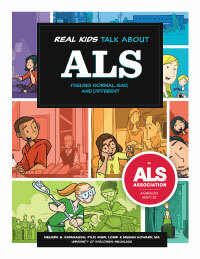 Delivered in a graphic novel format, this book uses direct quotes from youth in the ALS research projects. These quotes help situate the learning style and experiences of children in ALS. Choose your own adventure guide, middle school youth, ages 13-18. This book follows the stories of three youth, providing options for how they talked to people, who they talked to, and what was the outcome. 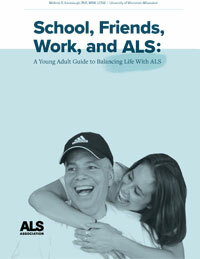 The book allows other youth to choose who they might want to talk about ALS and their experiences. A companion online version has been developed. Older youth/young adult guide, ages 19-25. 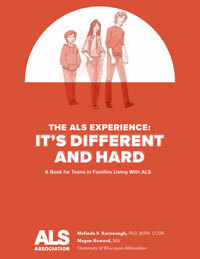 This book takes a more serious tone, again following several young adults as they manage their own lives with the care needed for their loved one with ALS, school and relationships. It is minimally illustrated and again uses actual stories and quotes.